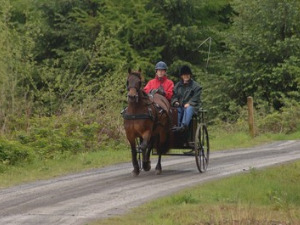 Carriage Driving / Hendre at Dyfnant & Vyrnwy Forests (NRW)0300 065 3000work Carriage DrivingHendre Car Park is the starting point for the carriage driving routes in the Dyfnant Forest. Experience beautiful countryside and breathtaking views. The car park offers hitching rails, picnic tables and a quiet area to harness up and put to. There is ample space for horse boxes. Hendre Pleasure Drive (5 miles, 8 kilometres). Where you can drive along and enjoy the excellent views of the forest and Dyfnant Forest. Glasfryn Marathon Drive (11 miles, 17 kilometres). With its scenic views of the Vyrnwy Valley. Gadfa Trot (7.8 miles, 12.6 kilometres). Which is a good trot for any pony. Melangell (7 miles, 11 kilometres). Where you can follow in the footsteps of St Melangell with a view of the craggy hill of Allt Dolanog. Hendre Car Park is the starting point for the carriage driving routes in the Dyfnant Forest. Experience beautiful countryside and breathtaking views. There are three car parks managed by Natural Resources Wales in Dyfnant Forest from which to start your visit. 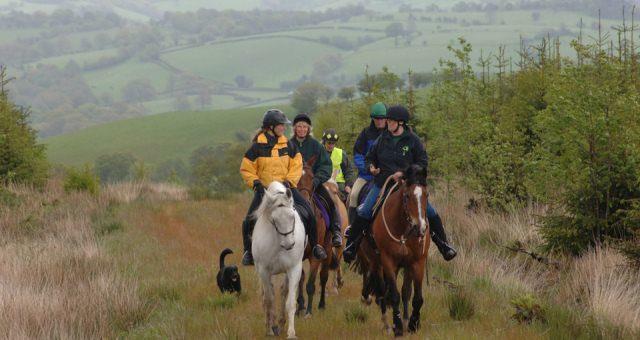 All three have free parking: Penyffordd – the hub for the Dyfnant Rainbow Trails for horse riders. The facilities here are: Purpose built car park with a one way system to allow drivers of horse boxes to roll in and roll out. Ample parking for horse trailers and cars. Corral for horses. Hendre - the starting point for the carriage driving routes. The facilities here are: Car park with hitching rails. Picnic tables. Quiet area to harness up and put to. Ample space for horse boxes. Pont Llogel - a small woodland with a waymarked short walk along the River Vyrnwy and access to two longer walks looked after by Powys County Council. Please note: Sometimes we need to close or divert trails for your safety whilst we undertake maintenance work or forest operations. Occasionally we may have to close a site in extreme weather, such as high winds or snow and ice due to the risk of injury to visitors or staff. Please always follow any instructions onsite and make sure you follow any temporary diversion signs in place. Take the A458 from Welshpool to Dolgellau road and turn on to the B4395 at Llangadfan to Lake Vyrnwy. After about three miles you reach the hamlet of Pont Llogel. Just over the bridge on the right hand side you will find the Pont Llogel car park. Penyffordd car park is located on the B4395 between Llangadfan and Lake Vyrnwy. You can get onto this road off the A458 (Mallwyd to Welshpool) at Llangadfan or off the A490 (Llanfyllin to Welshpool) at Llanfyllin, taking the B4393 and then left onto the B4395 signposted to Llwydiarth and Pont Llogel. From the Penyffordd car park: turn left onto the B4395 (from A458 Llangadfan heading to Lake Vyrnwy). Follow this road for one and a half miles before turning left by Hendre cottages on the corner. The Hendre car park is 300 metres up this road on the right hand side. From Llanfyllin: take the B4393 and then turn left on to the B4395 signposted to Llwydiarth and Pontllogel. Turn right by Hendre cottages. The Hendre car park is 300 metres up this road on the right hand side.